Video games as cinematic blockbusters? Sure. Video games as texts? I've heard that one too. Video games as vacations? 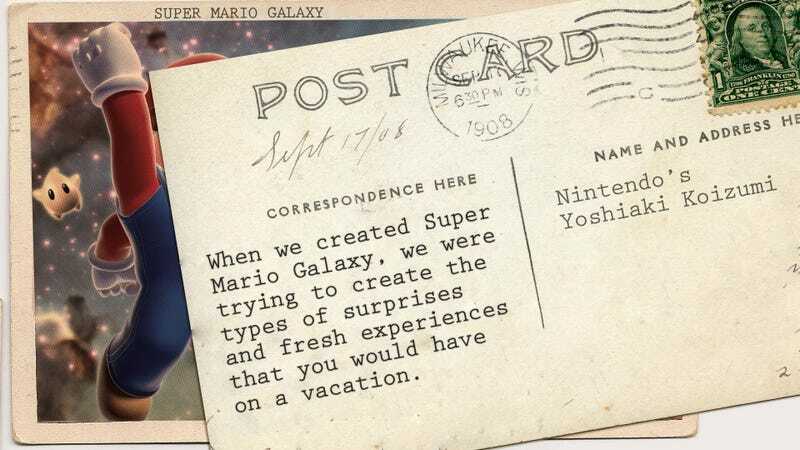 That one was new to me, but that's the concept Nintendo's Yoshiaki Koizumi had when he was telling me (quoted above in postcard format) about his team's approach to making a Super Mario game for a home console, as opposed to making a portable one like this month's Super Mario 3D Land. After the vacatio bit, he continued: "For Super Mario 3D Land, which is a portable game that people can play away from home, we added features like the ability to complete a stage in 2 to 3 minutes. The portable and console Mario games share the same core, namely, the fun of freely controlling and becoming Mario, and in that regard, there is no distinction between the two types of games."